Every WiCard has an internal page for settings, program and configuring the module. The default page address is 192.168.4.1. In this article we talked about how to configure your WiCard module. Also watch the tutorial video. 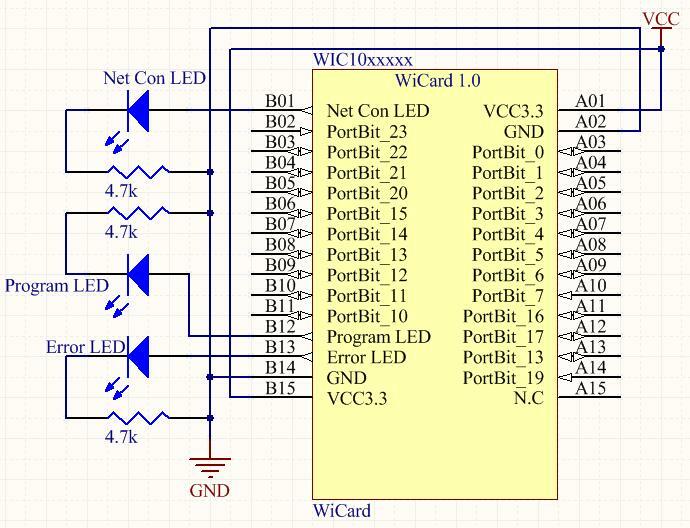 To turning the WiCard on, plug both VCCs (A1,B15) to 3.3V and both GNDs (A2,B14) to 0V. Power source must be stable. Also the power source must be able to drain at least 500mA at 3.3V. A few seconds after plugging the module to the power source, Net Connection LED (B1) will turn on. Then “WiCard SSID” will be visible. The default password to connecting to the WiCard access point is “0123456789”. The SSID starts with “WIC1”. Furthermore the SSID for trial firmware is “WiCard10_Trial”. After connecting to the WiCard access point (With a phone, laptop or any other devices which supports WiFi and web browsers), to configuring WiCard module there is a settings section in the internal page (the address is “192.168.4.1”). WiFi Router Settings is for setting a router SSID and Password to connecting the module to the internet. Furthermore the “Router IP” is the IP that the WiFi router gives to the WiCard module. Also all of the devices which are connected to the router can have access to the WiCard, with its IP. With toggling “Password For Router And Port Forwarding Connections” on, inserting the module “Access Point” password is necessary at the end of the router IP address of WiCard and also the router internet IP. 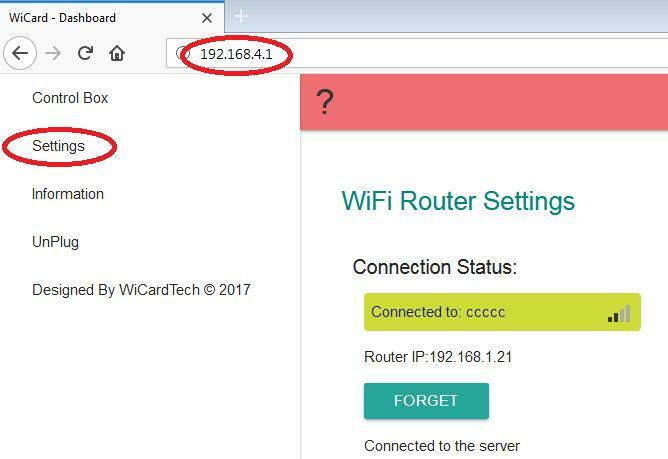 For example if the IP that the router has given to the WiCard is “192.168.1.21” for accessing to the WiCard from router, the correct IP address will be “192.168.1.21/0123456789/”. Internet data usage: sets the times that the WiCard will connect to the server to updating its data. 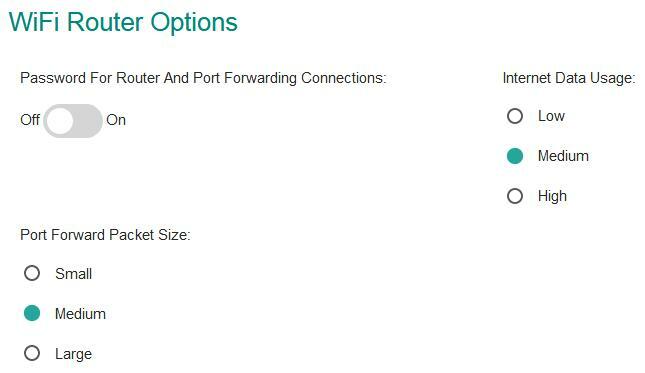 Port forward packet size: set the packet sizes that the internet provider supports. With toggling “Hidden AP” on, the module SSID will be hidden at the next startup. Also to changing the default WiCard access point password, use “Change The WiCard WiFi AP Password”. 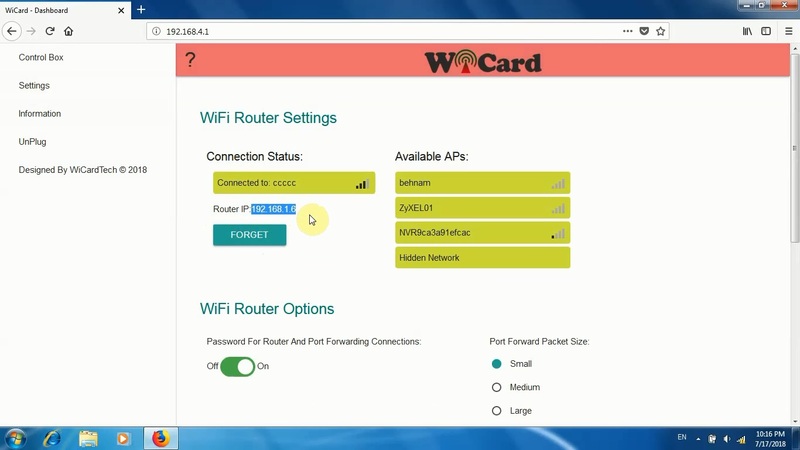 This video shows how to connect to WiCard via its access point and module IP in the WiFi router. If the WiCard has no program, or the user program has been compiled in “debug”, in WiCard access point “192.168.4.1/ResetToDefualt/” will reset the module. Also if the user program has been compiled in release mode, the address must be “192.168.4.1/ResetToDefualt/compilepassword/”. If you compile the program in “Debug”, in WiCard access point “192.168.4.1/Reset/” will clear the user program. Also if you compile the program in “Release” mode, the address must be “192.168.4.1/Reset/compilepassword/”.